Designed for one hand use. Soft, pliable pads protect fine finishes. Constructed from the same high-tech resin material as Quick-Grip bar clamps, strong, lightweight and rust resistant. Jaw contoured to hold round and odd-shaped objects. Handles designed for comfortable hand span. Refill pads fit your existing SL300 bar clamp; replace damaged or worn-out pads in your Irwin tools; snap right on your clamp. Clamp dust barrier to rod. Use pins to secure dust barrier to top foot. Double-rolled thread for faster clamping and increased durability; large swivel pad reduces marring on work surface and increases stability; large handle for greater clamping pressure with less effort. Metal spring clamps with soft-grip pads. Works with all TASK Quick Support Rods. Hardened steel. For hanging paint cans or other materials or tools. 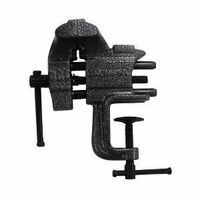 Olympia Clamp Vise, 2-1/2 in Jaw, 3 in Jaw Width, 1-1/2 in Throat Depth, Machined Smooth Jaw, Cast Pipe Jaw, 2-1/2 in Pipe, Screw Mounting, 1-1/2 in Mounting Hole Diameter, 270 deg Rotation Angle, Machined Spindle Handle, Steel, Powder Coated, 10000 psi Pressure New clutch system eliminates the need for threaded pipe. Larger feet offer more stability and clearance between handle and worktop. Larger, more ergonomic handle. Larger clutch plates allow for easier release and increased durability and dependability. New clutch system eliminates the need for threaded pipe. Larger feet offer more stability and clearance between handle and worktop. Larger, more ergonomic handle. Larger clutch plates allow for easier release and increased durability and dependability.